A portion of one of the world’s prettiest driving roads, the Pacific Coast Highway, was buried in a landslide Saturday eight miles north of San Luis Obispo, reports the BBC. Clearly, this is Mother Nature’s punishment for us all not going to drive it enough. The slide has been growing since it initially covered the roadway, reports Caltrans. Over a million tons of rock and dirt now cover 1/3 of a mile of the stretch of California Highway 1 that is part of the Pacific Coast Highway route. 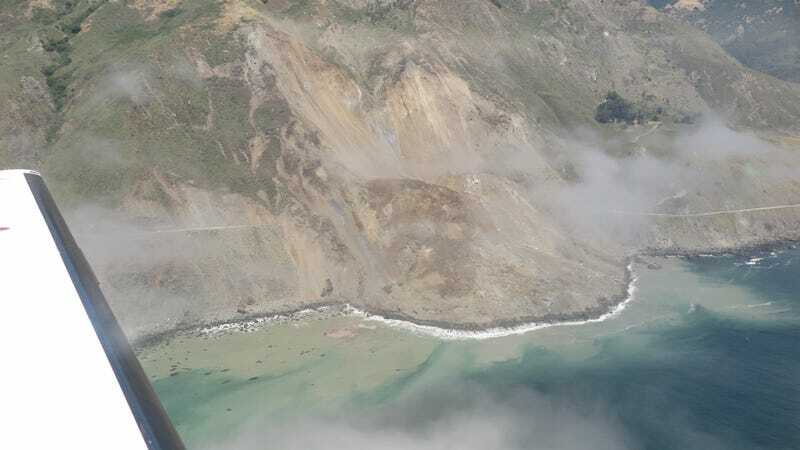 Debris is piled up to 40 feet high on top of the road, per the BBC, and photos show that it was a large enough slide to change the shape of the California coastline itself. The highway was already closed in this section from an earlier landslide, and this is just the latest of several to happen since January. Caltrans is working to clean the mess up, however, they are unsure when this section of the PCH will be reopened for traffic. The section runs through Monterey County’s Big Sur, a section of mountainous, barely-populated coastline that’s the perfect backdrop for a good drive. In the meantime, we’re in mourning for one of our favorite roads.